In the beginning, there were rocks. And cavemen. And water. A pretty simple existence, but people lived through it. Then humans became civilized, and they became consumers. They became bored with water, and needed something more, enter the sugar-laced, caffeine-infused drinks called tea, coffee, and soda. People could get energy and pleasure from their drink. But water still remained. 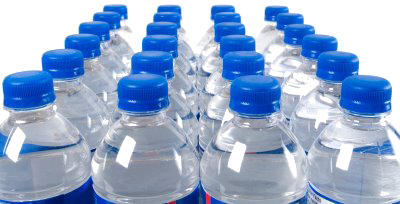 No one could escape the reality that the human body is made of over 70% water, and that we need at least 5 glasses per day of the stuff to survive. People found that when caffeine was added to water, it had a dehydrating effect on the human body, and when sugar was introduced, it made us fat and lazy. So water remained. Pure, tasteless, boring, life-sustaining water. Then folks started becoming health-conscious. They WANTED water, and embraced it's health benefits. But there was something still something lacking. Drinking water from a faucet seemed so...archaic. We were modern and health-conscious. Surely we could do better than tap water! That was the birth of bottled water. As our caveman ancestors looked on in amusement, we ran to purchase the stuff by the case, little bottles of pure, tasteless, boring, life-sustaining water...for about $1.50 a bottle. And life was good. But then someone got the bright idea that they could improve on it. Add things like vitamins and minerals, and additives to help give us energy, or sleep more restfully, or calm our souls. Enter Enhanced Water! Bottling companies went crazy, infusing their bottled water with additives such as chamomile, electrolytes, vitamin D, vitamin C, GABA, melatonin, fiber, ginseng, and even protein! They thought up catchy names, and started marketing their products the dubbed "Dream Water", "Propel", and "Life Water". And the crowd went wild! Now they could have their pure, boring, tasteless, life-sustaining water with even more health benefits! And at only $3 per bottle! And our caveman ancestors rolled their eyes. So, what have we learned? Simply put, whether for the purpose of promotion of health-conscious alternatives to traditional sodas, or to simply exploit the ignorance of the public, the companies selling us magic in a plastic bottle….well, they aren’t. The basic truth is this: nutrients are best delivered from the natural source where they are found. Energy, restful sleep, balanced nutrition, and peace of mind can’t be found in a bottle of anything…not even water. Thanks to Stacy Kelly for writing this article!